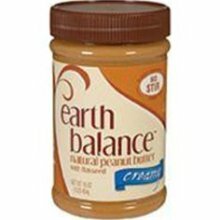 Can I just say Earth Balance's creamy peanut butter is hands down the best natural peanut butter out there? Matt even loves this stuff and he is not a fan of the natural kind of peanut butter and often gets grumpy that most store brands we grew up with are loaded with crap. This stuff is sweet, creamy and shelf stable! It is sweetened with agave and has the right sweet salty taste that you remember as a kid. I grew up with pb&j sandwiches packed in my lunch and on the weekend my dad would make waffles and would smoother pb all over the waffles! Now I enjoy pb with pancakes loaded with sliced banana and peanut sauce! I haven't tried that kind yet. Interesting that it's sweetened with agave - I'll have to pick up a jar! Ooooh Earth Balance keeps coming out with nifty new things! I gotta pick me up some of this...sounds amazing!